I'm not even sure how I got here today. I mean, I have lots of other things to do this weekend...Oh yeah. I'm a procrastinator. I procrastinate what I should be doing and work on other things. 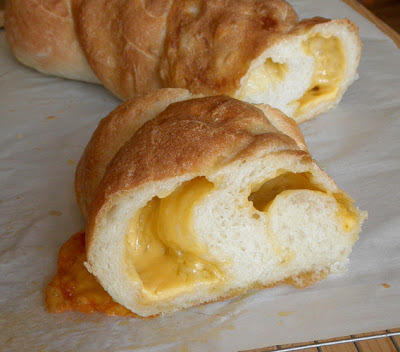 Like Cheesy Italian Bread. At any rate, I'm attempting to do something similar here, with a bread I'm surprised I haven't blogged about yet. 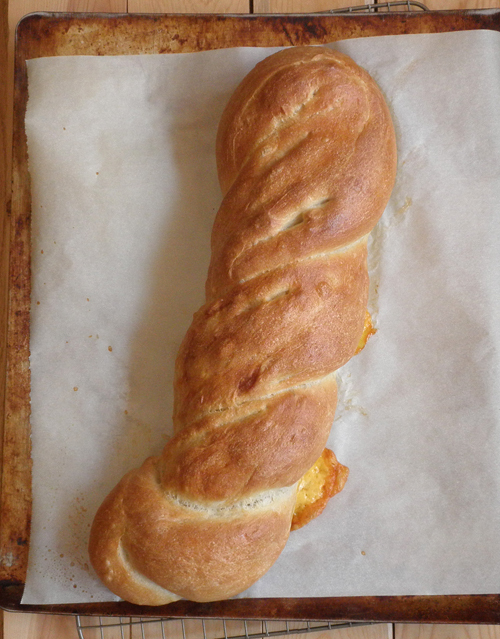 The reason I'm not doing the Italian bread on its own is because it's something my gluten-limited son would love, and I just don't have the heart to do that to him. I don't think he'd like all the cheese in this loaf. Somehow that makes me feel better about making it. Plus, I made a fresh batch of his favorite GF French Rolls today to keep him happy. They seem to have changed this recipe slightly from when I got it from King Arthur Flour, but click here if you're interested in a non-cheese version of this bread--at least until I make it and post it here. That may not be until Max is in college, though, so you probably won't want to wait that long. 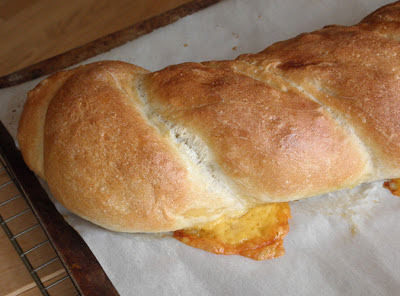 And if you're into making bread, I'm sure you can figure out how to remove the cheese from this recipe below. Have fun. 1. The Starter: Mix the starter ingredients in a small bowl, cover, and let rest at room temperature overnight. 2. Combine the ingredients as above, using a flat beater paddle or beaters, then switch to the dough hook(s) and knead for about 5 minutes; the dough should have formed a ball, but its surface will still be a bit rough. Transfer the dough to a lightly greased bowl or dough-rising bucket, cover the bowl or bucket, and allow the dough to rise for 90 minutes, turning it over and gently deflating it after 45 minutes. 3. Preheat oven to 425°F and line a baking sheet with parchment paper. 4. Transfer the dough to a lightly greased work surface, and press and pull it to a rough 7 inch by 24 inch rectangle. Place shredded cheese evenly down the middle of the rectangle. 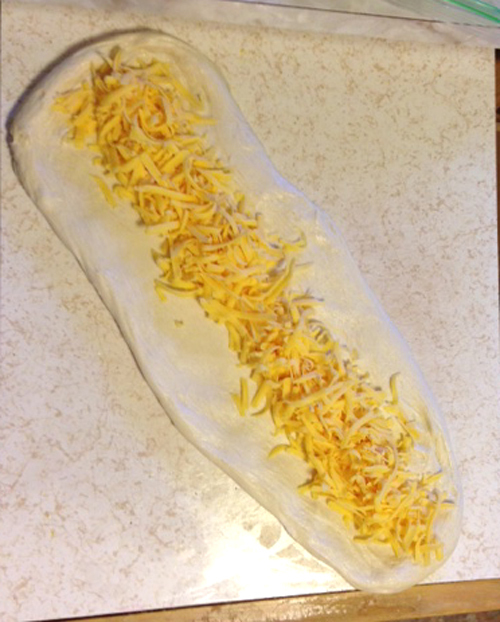 Fold one of the long sides over the cheese and then wrap the other long side over so you make a sort of log with the dough that now has a cheesy interior. Pinch seams a little to seal the dough. Squeeze, pull, and stretch the log to about three feet. Then fold it in half and twist as much as you can, like a rope. Pinch the end that used to be two ends together to seal. Place on a parchment lined baking sheet. Cover with a piece of plastic wrap sprayed with non-stick cooking spray. Allow to rise for 60-90 minutes, or until well-puffed. 5. Brush the twisted loaf with the egg white glaze. Bake the bread in a preheated 425°F oven for 25 to 35 minutes. Remove it from the oven and cool it on a wire rack.